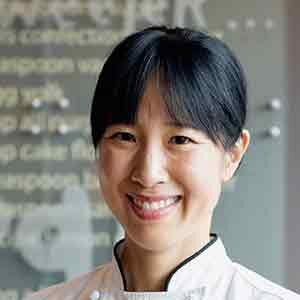 Joanne Chang is the chef and owner of Flour Bakery in Boston. A Harvard graduate with a degree in applied mathematics and economics, she left a career in management consulting to pursue culinary arts—to great success. Flour has been featured in Gourmet, Food & Wine, Bon Appetit, The New York Times, Condé Nast Traveler, Inc., and Boston Magazine and has received numerous Best of Boston awards. Chang has also appeared on the Food Network’s Throwdown with Bobby Flay, in which her sticky buns proved victorious. She’s the author of two cookbooks, Flour and Flour, Too. Call them fried pork dumplings, Chinese dumplings, or even potstickers. Whatever you do, don’t call them difficult to make. So much easier to make than you’d ever imagine. Just about as traditional as tradition gets save for the slight plot twist of maple syrup. “Much more sophisticated than the turnovers from my childhood.” “Very subtly sweet.” That’s what folks are saying. Limp onions that take 20 minutes to soften are no substitute for the complex sweetness of these properly caramelized alliums. Can’t beat this Milky Way tart with a stick. It’s a Flour Bakery specialty, and no wonder: buttery crust, milk chocolate mousse, chocolate curls, and caramel. This crust recipe from Flour Bakery in Boston is simple to make, buttery beyond belief, and is the perfect pal for rich fillings, as with the Milky Way Tart. These homemade Oreos aren’t the treats of childhood. These are intensely chocolate-y. Definitely a grown-up indulgence.